Theatre Pro Rata has found itself another perfect match in Sam Shepard’s play A Lie of the Mind. This latest production under the direction of company artistic director Carin Bratlie Wethern is an example of what they do best - find a meaty, perhaps difficult, definitely challenging script, and dig into it until it gives up all its secrets. The Pro Rata crew gets the story up on its feet in a sleek, economical package of design and performance, and shares with the audience all the reasons they should love the story just as much as the artists on stage do. If it weren’t Pro Rata and Sam Shepard, I’d find A Lie of the Mind a hard sell as a place I would willingly go to spend time. The story is launched in the wake of a domestic assault so violent that Jake (Nate Cheeseman) has left his wife Beth (Amy Pirkl) for dead. (Nothing says entertainment quite like spousal abuse, am I right?) Beth is very much alive however, if perhaps slightly brain-damaged. Unaware of each other’s fate, the two halves of this unhappy marriage retreat to the comfort of their respective families - although the terms comfort and family are both open to debate here. Beth and Jake’s dysfunctional marriage definitely has its roots in the homes from which they came. Jake’s brother Frankie (Gabriel Murphy) gets Jake reluctantly reunited with their brash mother Lorraine (Kit Bix) and long-suffering sister Sally (Joy Dolo). Frankie then heads off to see if Beth is really dead or Jake is just overreacting. Beth’s brother Mike (Bear Brummel) gets her through the worst of her medical troubles at the hospital and takes her home to father Baylor (Don Maloney) and mother Meg (Delta Rae Giordano) to hopefully make a more complete recovery. When Frankie shows up on their doorstep, events turn him into more of a hostage than a houseguest. Jake, pathologically jealous as ever, thinks the worst of Frankie when he doesn’t return. Jake decides to head out and find Beth himself, even though his mother keeps hiding his pants so he can’t leave home. Though there are four substantial female characters here, Shepard’s A Lie of the Mind is a story focused through a masculine lens. Shepard is exploring the challenges of what it means to be a man in America in the 20th century. Sadly the lessons here easily translate to the present day, 30 years after the play was first produced (likely before some of the people in the Pro Rata cast were even born). Even when the women have a scene alone together, A Lie of Mind doesn’t pass the Bechdel Test. The women here are collateral damage to the choices and failings of the men in their lives. They speak about and frame their lives in relation to the men at the center of them. This is hardly a celebration of the American male, however, as you might have guessed from the plot outline above. Nate Cheeseman presents Jake to us in all his paranoid, insecure glory, a guy who lashes out at the people he loves most because he lives in constant fear of losing them. Gabriel Murphy as Jake’s brother Frankie isn’t much better. He’s not a violent man, but as Jake’s primary support system, Frankie is constantly propping up a guy who maybe should just be allowed to crash and burn so he’ll stop doing harm to everyone around him. Beth’s brother Mike as portrayed by Bear Brummel means well, but his protectiveness is more than a little overbearing. One can hardly blame him, however, since he learned at the feet of their father Baylor. Don Maloney plays Baylor unapologetically, as a loudmouth and a tyrant. Beth was getting verbal abuse at home long before Jake started using her as a punching bag. It would probably come as a big surprise to Baylor that he doesn’t wear the metaphorical pants in his family. The people with the actual strength and resilience in this play are the women, though they’ve all chosen to take up residence in the background of all the drama created by the men in their homes. Amy Pirkl’s Beth is frustrating to watch, in a good way. She makes the unbelievable believable, that somehow despite everything she can’t quite let go of her love for Jake. Women stay in abusive relationships for all kinds of reasons and Beth is one of those women. She had to be carted off to a hospital, unconscious and bleeding, before she’d leave Jake. Now as she tries to learn to speak again and put her life back together, she still feels like it only makes sense with a man in the middle of it - and she might be auditioning Jake’s brother for the role. It’s a shame she doesn’t learn from her mother’s example. Though you wonder why Beth’s mother Meg puts up with Baylor most of the time, it’s clear she made a choice, and that she runs the place, though she never raises her voice like the men of the family. The mother and daughter on the other side of the extended family are further along on the spectrum of finally being fed up. Jake’s latest meltdown just reinforces his sister Sally’s eye-rolling attitude toward the idea of settling down with a guy. Joy Dolo is most entertaining when exasperated in her efforts to get either her brother or mother to see sense. Kit Bix’s trip down marital memory lane as Lorraine leads her to the conclusion that maybe it’s best to just burn the past to the ground and start over. Theatre Pro Rata’s production of A Lie of the Mind embraces Shepard’s innate theatricality. The design team of Ursula K. Bowden (set), Merritt Rodriguez (lights), Jacob M. Davis (sound), Cole Bylander (costumes), and Julia Carlis (props) create a dreamlike world where one scene, one place, one reality blends into another. Symbols like the American flag, or a bloody deer carcass, loom large here, and yet never seem out of place, or to bend reality until it breaks. Just like the characters on stage, the audience gets to see people both as they are and as others see them. No one’s point of view here is without its flaws, and the fluid nature of time and place created by Pro Rata fits this world perfectly. The strangest thing about A Lie of the Mind is the balancing act of its ending. It’s not a standard issue happy ending, but neither is it bleak or nihilistic. You get the sense that these people’s lives go on, and that it’s not a bad thing for anyone involved. Of course it’s a largely white family, with a white family’s problems and means, so maybe it shouldn’t come as a big surprise that they bounce back. 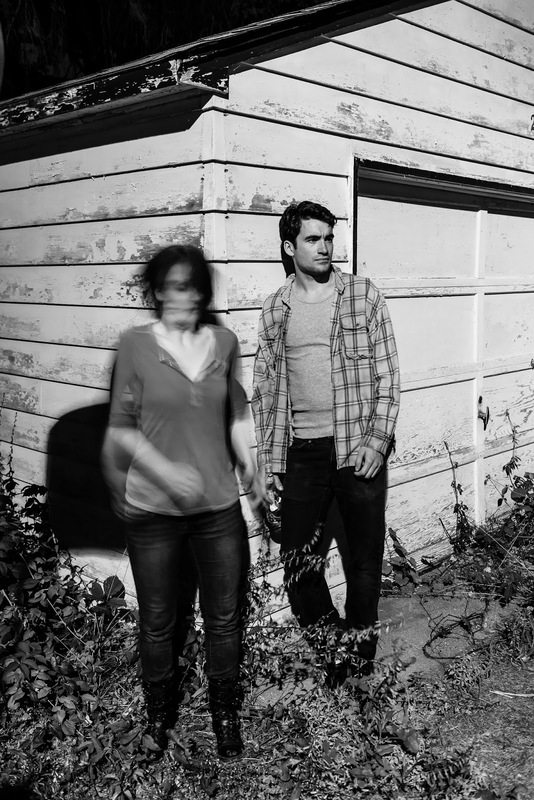 But Pro Rata’s production is an unflinching look at a segment of America that’s used to getting off easy in the way it’s portrayed. The heroes aren’t easy to spot here, and the villains aren’t easily dismissed. It’s both nice and a little unsettling that Shepard’s complex portrait of the American family doesn’t seem dated in the least. I’ve been struggling with what to write about Sandbox Theatre’s latest production as part of Southern Theater’s ARTshare program - The Little Pilot. Everything I come up with ends up sounding insulting, which is not my intention. So let’s start with the basics - The Little Pilot is inspired by the life and adventures of award-winning author Antoine de Saint-Exupéry, most widely known for his children’s book for adults, The Little Prince. Saint-Exupéry was also noted for his exploits as a pilot, both before and during World War II. His life and career unexpectedly ended when he and his plane both disappeared one day on what seemed like a routine reconnaissance mission. 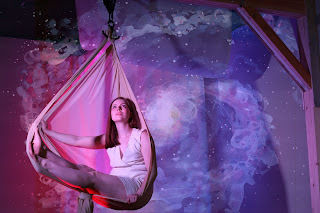 In order to give the production of The Little Pilot a taste of that gravity-defying feel of flying, Sandbox is incorporating aerial work on silks into its storytelling for the first time. As someone who is afraid of heights (heck, I sometimes wobble a little just making my way down the steep stairs in the seating at the Southern Theater), the impressive work by actors who aren’t professional aerialists kept me on edge while also marveling a bit at the way they hung suspended in mid-air. The aerial work itself comes off well - I was never afraid for the actors, they always seemed to know what they were doing. Contemplating hanging in the air like that myself was the thing that gave me pause, kept me impressed, but never took me out of the story. In many ways the aerial work is the chief selling point of the production. It’s the story of The Little Pilot and the way it was told that didn’t ever quite click for me. And the aerial work, though well done, was like a rousing song or dance number in a musical that didn’t help the forward motion of plot or character. It was never fully integrated into the rest of the production. The aerial work had its moments, but the story always seemed to stop for a minute until it was done, then lurched forward again. For me, Sandbox has always flirted in the territory of being labeled pretentious. The thing I admire about them is how they consistently avoid falling fully into that trap. Not always, but most of the time. The Little Pilot is a victim of this temptation on the company’s part. In past, more effective productions, Sandbox always digs under the veneer of the things which might make your eyes roll (a title like .faust, a collection of inept performance artists, the fascination with the French language), and make you care about the characters involved in the stories as human beings with real emotions, hopes and fears (even when they're not human). The Little Pilot assumes that everyone knows and loves the story of The Little Prince, and thus would be fascinated to see the life of its author explored. The production team of artists behind The Little Pilot makes little or no effort to show us why we, like them, should be equally fascinated and in love. The assumption makes for a dry and often confusing story of the storyteller. Art about artists frequently rubs me the wrong way because of its reasoning that, because someone creates beauty through art, that person and their personal story are also worthwhile and important topics for discussion. In fact, in some of my more uncomfortable moments watching The Little Pilot, I got the distinct feeling that I was watching something unintentionally bordering on parody - a parody of the kind of production Sandbox does, rather than an actual Sandbox production. We already had the preoccupation with all things French, especially artists (our novelist main character). We had the small ensemble (Christian Bardin, Mark Benzel, Evelyn Digirolamo, Jonathon Dull, Katie Kaufmann, and Patrick Webster) playing multiple roles often across gender. There’s Tim Donahue’s live music supporting the mood and pace of the production (great here, as always). Halfway into the piece (in what felt like a move executed way too late in the game), we’re suddenly introduced to Saint-Exupéry’s rag tag band of fellow daredevil pilots - each manifested with their own larger than life physical presentation and vocal inflection. Toss into the mix the fact that five out of the six performers each play the lead character Antoine at a different stage of his short life, but there’s very little done to distinguish one version of him from another, or to make Antoine stand out in any significant way from the other characters around him. Then layer on the aerial work and the projections of visual art. This production is a first for the project co-leads - acting ensemble member Evelyn Digirolamo, who skillfully got her castmates up to speed on the silk work elements of the performance; and Kristina Kjellman, who provided the intriguing artwork that got projected on walls, silks and human bodies. Also first time in the Sandbox director’s chair for company member Theo Langason. A strong argument can be made for the fact that you can't expect anyone to expand their skills and improve if you don't give them a forum in which to do that. And ARTshare exists, in part, to give the participating companies a stable home base from which to work, so they can experiment with new and different things. Honestly, what they needed here was either a writer or a dramaturg - someone who could sit outside of the story and all the fascinating research and inventive physical work and see if there was any kind of structure or build to the story underneath the production. When ensemble-created work succeeds, it’s a marvel. When it doesn’t, more often that not it’s because the production doesn’t have a strong narrative spine underneath its shiny skin. There’s a compelling idea and a good collection of ingredients in The Little Pilot - the whole thing’s just not quite cooked yet. Still, though it might not be all it could be yet, The Little Pilot is still worth seeing for what it is.